First, I’ll assume it was a jetliner you saw, since the illusion is much less pronounced with “regular” airplanes (which fly slower and lower). At any given point in the flight, both sound and light are being emitted by the jetliner. Technically, in the daytime, the light is being reflected, not emitted, but no matter. The light is what allows your eyes to see the jetliner, and the sound is what allows your ears to hear it. Both light and sound move outward from the jetliner, but at vastly disparate speeds. For the sake of calculation, we’ll assume the jetliner is at a distance of 8 km (5 miles) — that would be typical given their cruising altitude and the distance from which you could hear the engines. The light, of course, arrives first. It takes only: t = d/v = 5 miles/671,000,000 mph = 0.000027 seconds to arrive. The sounds takes: t = d/v = 5 miles/768 mph = 0.0065 hours = 23 seconds to arrive. Your average jetliner has a cruising speed of around 500 mph. So by the time the sound arrives (23 seconds later), the jetliner has traveled: d = vt = (500 mph)(0.0065 hours) = 3.25 miles (about 70 times its own length). And that’s why jetliners always appear so far ahead of their sound — unless you’re right next to it on the runway. You could actually estimate the jetliner’s speed by measuring how far ahead of the sound it appears. 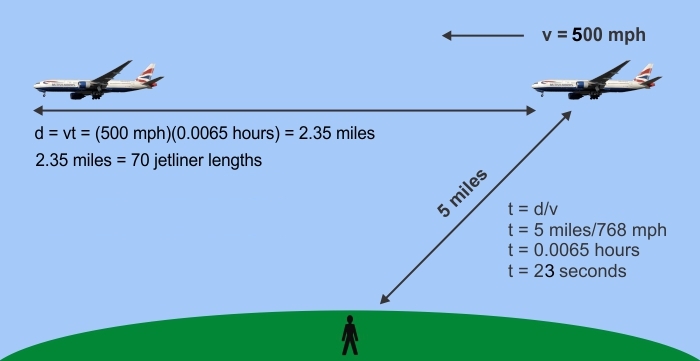 During the 0.000027 second delay it takes the light to arrive, the jetliner will travel only 0.2 inches. So you actually see it slightly behind where it really is, but there’s no way you’d notice that 0.2 inch difference from a distance of 5 miles. Something similar happens with lightning and thunder, when you hear the rumble several seconds after seeing the flash. Using the same equation as above, you can estimate the distance to a lightning strike: for every 3 seconds delay, the lightning struck 1 km away (every 5 seconds equates to 1 mile). I did a nice animation about lightning and thunder back in my July 28, 2014 post. I hope you followed my explanation, VC. I kept it as simple as I could, but needed to do a little arithmetic using a basic equation from kinematics: d = vt (distance = speed x time). We also had to convert between “miles” and “inches” (1 mile = 63,360 inches) and between “hours” and “seconds” (1 hour = 3600 second). Being in the 6th grade, I’m sure you can handle that math.